Howdy there, all y’all Vinously Speaking readers! Hope all is fabulous on your end of the internet! Here we are, at the post I promised you … about the new french town I am living in since moving from Dijon back in the beginning of July. As luck would have it, he found a job as a corporate lawyer for an insurance company called Groupama. *This is the Groupama mascot. Her name is ‘Cerise’ (pronounced ‘sir-eez’), which means ‘cherry’ in french. Not even a full year later, he was offered a promotion … impressive, I know! But the catch was … he had to move to their offices in a small town about an hour away from Dijon. Now, when Frenchie Le Boyfriend received this promotion offer, I was still under the impression I would be returning back to the US to do my Master’s thesis/internship. Naturally I made complete fun of him for needing to move out to the country. But, as you all know a whirlwind of events transpired leading me to stay in France to do my internship/thesis with Catavino, so now the joke was on me, because now I was going to be moving to this small town with Frenchie Le Boyfriend. I know, I know, there are smaller towns out there, and I’m from Texas, so I should feel a bit more ‘at home’ about the whole thing… I mean Dijon was small as well, but Dijon had a population of around 150,000 … and that my dear VS readers is where I draw the limit. In any case, I’ve always been an optimist, so after a few days of sitting in a catatonic state, I decided it was about time I put on my ‘big girl pants’ and made the best of things. First off, I get to spend more time with Frenchie Le Boyfriend, my little doggy, Miss Dolce, who is totally in love with nature and there is a lot of that here in the country. It is also kinda cool to be able to say I lived in the french countryside, not many people get to say they did that. There are a lot less distractions here so I have LOTS of time to work on my thesis/internship/blog. I have also been able to get back on my exercise routine, so all those cheese & wine kilos I had gained in my time here are beginning to melt away. And the best of all is that Chaumont is located in the region of … Champagne! Yes folks, that is right. I moved from Burgundy to Champagne. And let me tell you how awesome it is to be able to drink ‘veritable Champagne’ at such ridiculous prices … it would make a grown, wine-loving man cry. What a dilemma, Happy Hour is on wine and champagne ONLY! =D haha! I suppose I can live with that! 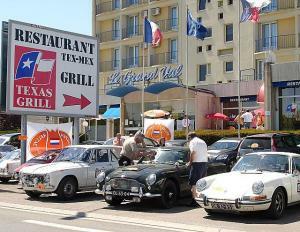 So here it is folks, my post to ‘Chau’ Off Chaumont! Now since I am dedicating this post to a VS reader named Karen from Manitoba, Canada … I decided to go around Chaumont taking pictures wearing Canadian flag colors! =) Hope you enjoy! The view behind me is “Old Town” (Vieille Ville) Chaumont. 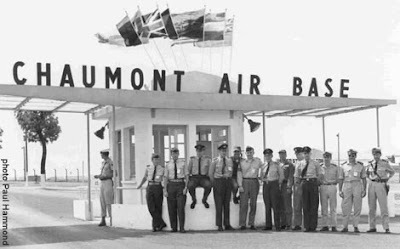 The name Chaumont came from its original Latin name, ‘Calvus Mons’ meaning ‘bald mountain’. It was called this because it is situated on a bare plateau overlooking the Marne Valley. Its citizens are called, “les Chaumontais” (pronounced ‘lay-show-mone-tay‘) and the town was constructed in the 10th century. It is about 100 km (62 mi) north of Dijon and about 260 km (162 mi) south of Paris. A view of the Chaumont countryside! It is pretty isn’t it! The structure on the left of the picture above are the remains of the 12th Century castle that was once home to the Counts of Champagne, (the castle’s keep, known as the ‘donjon’ and the ramparts), however there are a number of other ancient structures throughout the town (the town hall, Jesuit chapel, the Basilique St Jean) that have survived in their entirety. This is the ‘Donjon’ (the oldest relic in Chaumont) which was built between the 11th and 12th centuries. It served as a fortress, then housing for soldiers, and then a prison. Now you can take a tour of it and it also houses a small Museum of Art & History. Here is the view looking from the ‘Donjon’. Breathtaking no? This is ‘La Chapelle des Jésuites‘ built in the 17th century. It is no longer a ‘functioning’ chapel, but is now used as for art expositions. I don’t know what this building was before, but now it’s a bank. Pretty fancy building for bank right? This is their Town Hall … fancy for a small town. 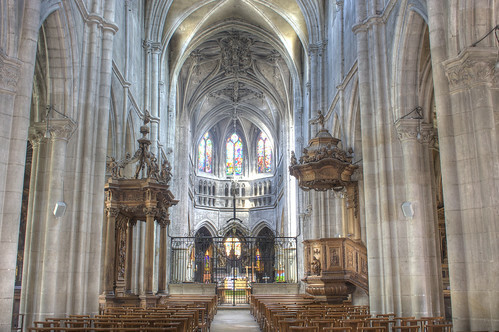 The famous Basilica of St. John the Baptist (Basilique St. Jean-Baptiste), constructed in the 17th century, is not as famous for its outside architecture but rather for its high-relief interiors as seen below. 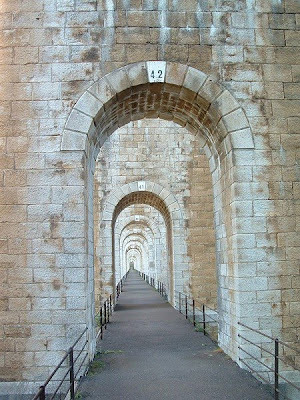 The viaduct was constructed in 1857, it is now a railway and “the symbol for the town’s cultural and geographic link to Paris” (kinda stretching its importance a bit no? haha) Regardless, it is pretty impressive to look at. For the most part, those are all the historic sites of interest here. What else is there to say about Chaumont …? Well, here is THE movie theater of Chaumont, lol. meaning that is has been “chosen after a rigourous selection process, based on both the care they have taken with their floral decoration and the beauty of their parks and gardens, and the work they have done to improve the living environment and give visitors a friendly welcome.” The best ‘floral towns’ are awarded 4 stars (205 of them last year), Chaumont was awarded 3 … not bad, not bad. I must say, it is nice to walk around and see flowers everywhere. I have also noticed Chaumont has an obsession with blue doors … during my Chaumont photo shoot, I snapped some photos of a few … I wonder why? Chaumont also has an incredible amount of spiral stair towers, apparently there are like 70 around the city! It was formerly the French capital of glove making. They have a top-ranked professional Volley Ball Team and they host the national horseback riding championships. Chaumont is known as the ‘poster town’ and it hosts the International Poster and Graphic Design Festival each summer, attracting visitors from all over the world. It is also internationally known for its center for book and poster art. The collection currently holds over 20,000 posters and adds over 1,500 each year. 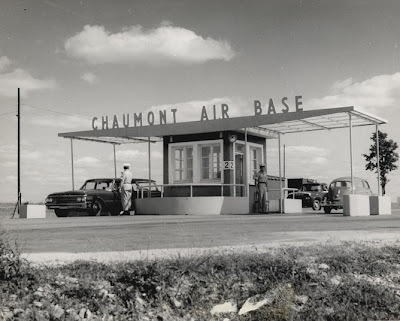 One VERY interesting thing about Chaumont was that it was home to a US Airforce Base during the World Wars!! Crazy huh?! Many people here still remember the ‘good time’ as they refer to it, the days of the Americans with their big cars, jazz and rock and roll, and all the dollars that were flowing through the city! There are even 2 ‘American style’ neighborhoods here that were built for the American officers back then. It is crazy to drive though them! The houses are very different from the french styles of housing. I feel like I am back home! One of the ‘American style’ neighborhoods. I snapped a photo of one of the houses =P I am sure it may not seem like anything, but I kid you not. They don’t make these style homes here in France. Unfortunately, or fortunately?, there aren’t any Americans here anymore … or at least I haven’t met any. But the you can still see signs of the ‘American influence’ … you still see a few of the ‘big cars’ being driven around by the soldiers who probably sold them to town folk for a pretty ‘franc’. They recently started an annual ‘Country & Line Dancing Festival’. Here is a video from the festival 2 years ago. You have to admit, they make a good effort! Well, I am sure that is a lot more than you wanted to know about my new little french town of Chaumont. (I know its more than I did, lol). I need a glass of Champagne right about now, lol! All jokes aside, I believe that things happen for a reason. I am thinking the reason I am here is to really buckle down and bust out an incredible thesis, drink Champagne at an affordable price, and show these Chaumont folk how line dancing is really done! Hope you have a great day VS readers! Spoil yourself and go buy some Champagne (or some Cava, Prosecco, Cremant, or other yummy sparkling wine)! I LOVE IT. I WAS WITH THE 48TH SUPPLY SQDN IN 57-58 AND WISH I COULD GO BACK TO THOSE GOOD DAYS. WOULD LOVE TOP HEAR FROM ANYONE THAT WAS THERE.